...I was out in the rain yesterday and saw a lot of daffodils, happy spring to you. 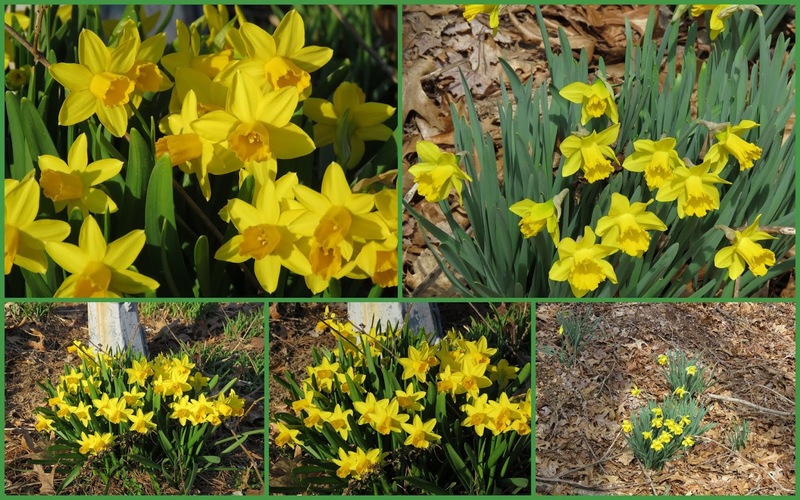 Beautiful images of the daffodils! They are so pretty. The frogs are laying eggs in my pond too later on. It's still covered with snow. The birds are wonderful as always, but you can probably guess that today it is your daffodils that are making me happy. I love these beauties so much and do not see them at all these days. love the frogs and would love to live on edge of forest. our rain barrel the frogs are doing their thing. 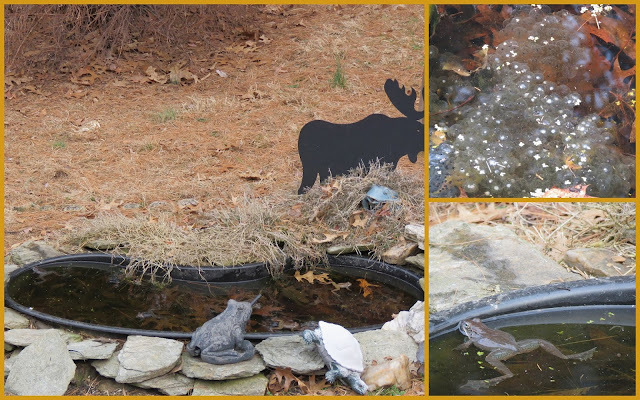 as soon as they do I am aborting the eggs.. no more frogs or tadpoles in the rainbarrel…. 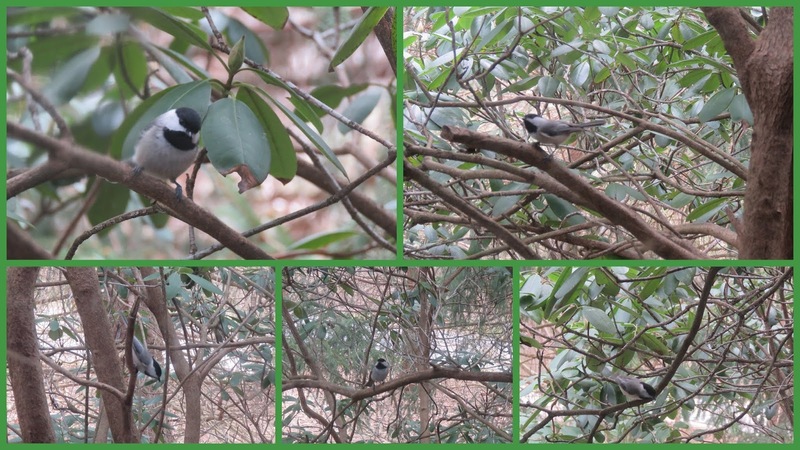 Your shot of the chickadee reminded me I haven't filled my feeders. Glad to see herons are making more to their nest, it does look a bit insecure at this point. You soon will have tadpoles to add to your zoo! No daffodils here yet but hopefully if we get some warm weather we will see some soon! Wonderful springtime... I enjoyed the description and captures. I am always amazed at how fragile heron nests are. the daffodils are so pretty and what a gorgeous image of the heron!! Last year was the first time I saw blue herons in a tree. It was fascinating to watch them. Eileen - we have Montana spring-time weather today. One moment sun, the next a blizzard of flurries! So I got a kick out of your daffodils and the fact that you have already seen frog eggs. They sure didn't waste any time! Thanks for linking to Mosaic Monday, my friend! The blue herons are usually seen in the water here. The one in the tree is beautiful. The flowers are very pretty to see. Nice images, Eileen and have a wonderful day and new week. Lovely spring images, Eileen. Have a great week. Golden colour, a lovely shade to herald in the bulbs of spring. The Great Blue, a stately bird, and needing a bigger nest maybe. The daffodils are pretty. I always love your great heron pictures. How lovely to see spring! You have so much going on...and beautiful daffodils!! I have a few daffs but oh my! Yours are glorious. One of my favorite flowers! Hello Yellow! I've been enjoying daffodils too! All your flowers are lovely, and the other photos are really neat. Thanks for sharing them Eileen and have a great week. The flowers especially are very beautiful. Thanks for sharing. Beautiful daffodils, wish they lasted a bit longer. Great picture of the heron. These Spring flowers sure bring back memories of my childhood. We always had lots of them in the flower beds, doubles and yellow and white ones too. It was more like Spring here today so we hiked! Enjoy your week sweet friend! The frogs are really croaking these evenings! I wonder how many we have around our pond? Love your daffodils and the birds that visit you. Spring...at last! Thanks for sharing. A great holy week to you! Me alegra ver tantos narcisos. Preciosa primavera tienes Eileen. Chickadees are such cute little birds! Love the flowers! Terrific shots! You're well ahead of where we are at present. Beautiful photos Eileen, I think Mother Nature is at her best in Spring. Superb shots. I have a soft spot for blue herons. They're beautiful. Gorgeous floral shots ~ so colorful! Your spring is ahead of us, of course, but we are getting there. Many migrants have returned and are staking out territories and seeking mates. Renewal is in the air. Stunning photos Eileen, I love the miniature in at second, beautiful. Så nydelige vårtegn med påskeliljer. So nice to see your daffodils and fabulous photograph of the Blue Heron. Yay for Spring being in the air in your neighbourhood! Lovely daffs and cheeky little birds are very cheery! Daffodils signal spring to me! We have lots of them in the mountains near San Diego. They are so cheerful and bright! My daffodils have been blooming and the dogwood is opening up. Spring is springing all around! And isn't it fun to watch? Gorgeous photos! Our daffodils are fading but the tulips are opening. I'm new to Our World Tuesday, but I hope to participate more often in the future. Very nice photos. Thumbs up.